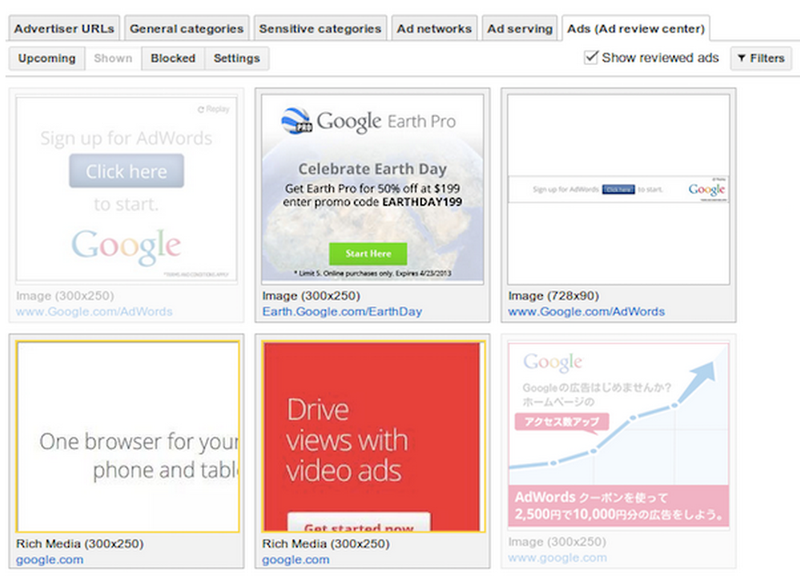 Inside AdSense: New Ad review center features help save you time and offer improved controls. New Ad review center features help save you time and offer improved controls. to review and control these ads. From today, enjoy more choice with new updates designed to save you time and give you more control in the review process. You’ll also have more choice when reviewing ads with our new ad size widget. Using the widget, you can review ads according to their size. If you want to review only the banner ads on your page for example, they’ll be quick and easy to find. We’re still fine-tuning this feature meaning it’s possible that not every single ad of a particular size will be captured right away, but it will capture the majority of them. You’ll now also have more control with new enhancements to our related ads feature. Over the next few days, related ads will start to identify ads containing the same logo. It’ll then group together different ads containing that logo and give you the option to allow or block them running on your site. This feature will also cover ads containing the same video. Finally, we’ve given the Ad review center a new look with a brand new user interface designed for quick and simple navigation. Try out these new features today. We’re continuously looking for new ways to make this a valuable tool for you - please tell us what else you’d like to see over on our AdSense+ page. Having the right information on the ads displayed on your site and being able to control them, is a big ask we hear from publishers. Many of you are already using the Ad review center to review and control these ads. From today, enjoy more choice with new updates designed to save you time and give you more control in the review process.